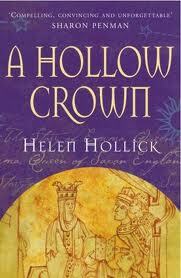 Helen Hollick’s story and publishing history have strongly influenced my thinking about Indie books. It is one of the reasons why I believe so fervently that HIGH-QUALITY (because yes, sadly, many Indie books are still not high quality) Indie novels can be the equal of any mainstream book out there. I want to share her story with readers who self- or subsidy-publish because, through her journey, she gives us important insights on the publishing world in general and how to succeed even without the backing of an agent or a mainstream publishing house. Thank you, Helen, for sharing your story with us. If you are an author who has been previously published by a mainstream house and now self-publishes and would like to share your story with readers, please contact me. I would love to run a series on this topic. How were you originally picked up by Heinemann (UK) and Sourcebooks (US)? Did you seek out an agent or did a publisher find you? Can you describe the process you went through? I was very, very, lucky. I was then lucky enough to meet with Sharon for a coffee when she was next in London – and it was so delightful to talk to an accomplished writer about history and writing. Generously she offered to read my first two chapters and, bless her, she pointed out all the technical errors, such as over-long sentences, point of view changes, author’s voice. I took on board all she had said, finished the book and sent it to her agent (with a covering note from Sharon.) The agent took me on. Some short while later, Heinemann approached the agent hoping to tempt Sharon to their lists, but she was contracted for several more books to her own publisher. “I have her protégé though,” said the agent. That was it, I was signed. 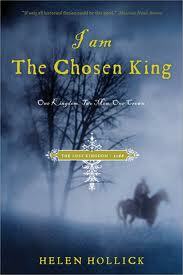 The result was The Kingmaking, Pendragon’s Banner and Shadow of the King – The Pendragon’s Banner Trilogy. On your website, you say that in 2005 you had a disagreement with your agent—can you expand on this? Is what happened to you a common problem between authors and agents these days? If you notice above I didn’t mention the agent’s name. Unfortunately, yes, we had a major disagreement – although I had lost faith in her quite a while before 2005. I had not felt that she was “on my side” for quite a while. Several ideas that I had sent her for possible novels had either been ignored, or come back as “not worth bothering with”; nor had there been any marketing for my fifth novel, A Hollow Crown – or any apparent enthusiasm for my published books. I trusted her though, assumed she was doing her best for me. I was wrong. She had lost interest. I realised this when I had poured my heart and soul into a new project – Sea Witch. The agent wanted me to write something different, Pirates, because Johnny Depp and Jack Sparrow were all the rage. Nautical novels abounded, but most were Patrick O’Brian, C.S. Forrester type novels, aimed at a male readership; there was very little – to none at all – fiction of a similar nature to the Pirates of the Caribbean movie. Certainly nothing for us adult Jack Sparrow fans who wanted some swashbuckling adventure, with a bit of fantasy and a very drool-able hero. 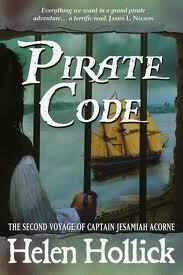 I looked for books to have a “pirate fix,” couldn’t find any, so wrote my own. Sea Witch just poured out of me. I was in love with Captain Jesamiah Acorne, the moment I met him. Unfortunately, the agent did not have the same crush on Johnny Depp and was not interested in rogue pirates. She wanted me to write Treasure Island for teenage boys. I wanted to write Frenchman’s Creek with a touch of supernatural for adventure loving grownups. I was told the manuscript I had submitted was rubbish (it came back with red lines scrawled across it, and words such as “This is so-o boring, yawn” written over it. On the telephone she told me she couldn’t bear to read that nonsense again, so I had better find myself another agent – and by the way, Heinemann were not going to reprint my backlist, wished me luck for the future, and put the phone down on me. I was utterly shattered. That cliché of “felt like she had been kicked in the stomach” – I assure you, it really does feel like that. I spent two weeks sobbing, completely devastated. Then picked myself up and decided I did not need her. What had she done for me the past few years anyway? Absolutely nothing. What did I have to lose to try and start again? I have since come across several other authors who were similarly “dropped” by agents who, to put it bluntly, could not be bothered with mid-list authors and their backlist and out-of-print books. If you have a good agent who backs you to the hilt, is there to encourage and assist because he or she knows you are a darn good writer with a lot of untapped potential – then support that literary guardian angel to the best of your ability. A good agent is an absolute treasure! A bad one is about as useful as a chocolate teapot. I, along with many other readers, loved Sea Witch, and you have a proven track record of marketable writing, so I’ve got to ask why isn’t the series being mainstream published? Thank you, several top authors have said they think my Sea Witch Voyages are probably my best work (although other readers prefer the straight historicals – I suppose it all comes down to preference, doesn’t it?) I put my heart into writing Sea Witch – I even wrote on Christmas Eve and Boxing Day, taking a break only on Christmas Day itself. The words literally poured from me, I don’t remember writing half of it, as the story wrote itself. After being dumped by ex-agent and Heinemann, I touted my backlist and Sea Witch round a few publishers. No one wanted to know. Two reasons: sales figures for my historical fiction were poor, because beyond the first book, Kingmaking, and a little for my 1066 novel Harold the King (US title, I Am the Chosen King), there had been no marketing. No marketing = no sales. And who wants to take on a has-been author? I soon realised that I wasn’t being snapped up because I was considered a “failed” author – and because publishers like easy-to-market genres. Square pegs in square holes. Sea Witch is cross-genre, it is historical adventure fantasy – not quite one, not quite the other. And mainstream publishers do not like taking a punt on the unknown. Nor on dumped authors. That was not going to stop me though. Sea Witch was going to be launched – I was determined to prove that ex-agent, and all those publishers, wrong. In the end, you decided to self-publish (SP). Can you talk a bit about what you found in the self-publishing world when you first began your search for an appropriate outlet? So I found a small independent company – who had an even smaller mainstream imprint. I did pay towards Sea Witch being published – basic set-up costs – but soon after publication I was moved to their miniscule mainstream offer, which meant they covered the cost of production. It was not ideal because the company was very small, they had staffing problems, and as it turned out, financial problems as well, but all my books were in print, including Sea Witch and two more “Voyages,” Pirate Code and Bring It Close. The company was in trouble, so with new office premises, new, enthusiastic staff who knew what they were doing, it re-launched under a different name, with good intentions and high aspirations. I was happy to back them because having been let down by the “big boys,” I wanted the Indie side to do well. Things were not smooth though, and a lot of their clients, including myself, were eventually seriously let down by the managing director when the company went broke. All the staff, I must add here, were lovely – absolute gems. They were stung as much by the company owner as much as us authors. Being honest? The quality of my books published by Discovered Authors/Callio Press was less than acceptable. But the few years that I was with them tied me over, kept me in print (and not at my own expense) and perhaps more useful, I had a very sharp learning curve about the dos and don’ts of independent publishing. The one big thing that assured me that I was doing the right thing (even with a company that was not as good as it should be) was that I was approached by Sourcebooks, Inc of the USA. The M.D. had always loved my Arthurian books and approached me for the American rights. I had full control over my books, so I signed up. And God Bless my American readers, thank you, I am doing really well with my straight historical fiction! 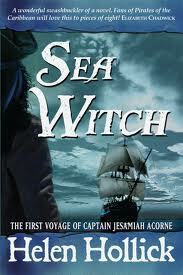 As with other publishers, though, Sourcebooks is not interested in the cross-genre Sea Witch series. If I ever figure out why publishers do not want good books I’ll let you know. Why did you choose your current SP company, SilverWood Books? I had met with Helen Hart, the director of publishing and owner of SilverWood, at the London Book Fair. I instantly liked her, her vision, and her honesty. When I realised that Callio was about to go belly-up, I contacted her again, asking for more information about going with her company – assisted publishing. I briefly considered literally going self-publish, doing it all myself, but I have very limited technical skills, and being frank, I’d had enough of my books looking unprofessional. I wanted them produced to a quality standard. It was expensive – nothing worthwhile is cheap, but I’d had a small legacy from my mother’s estate, and decided to use that for my books. Have the conditions surrounding the SP market improved or deteriorated since you began your search? I think improved, as far as hard copy books are concerned. Although there is a long, long way to go, and reaching that position of “respectability” is up to self-published authors. More recognised mainstream traditional authors are turning to self- and assisted-publishing for their out-of-print backlists. The big publishing houses are often not interested in old backlists, so authors are becoming empowered to “do it yourself.” As I said above, even one book a month is better than none at all. The development of Kindle and e-books has completely opened another market for Indie writers. It is quick, easy, and cheap to upload an e-book. But sadly, cheap is the word…. You are an advocate of high-quality self-published books that adhere to the standards of mainstream publishers. Can you tell readers why you believe adhering to these standards is crucial? Cheap, amateur, unprofessional, poor quality. These are the words usually – and sadly, often correctly – associated with self-published/Indie books. Indie authors only have themselves to blame because too many do not take care in the production of their work, and what is more alarming, too few fail to realise why quality, professional production is important. As UK editor for reviewing Indie published novels for the Historical Novel Society, I have found some absolute gems – novels that I cannot understand why mainstream did not grab them. But, oh dear, I have also been sent some sad, sorry books to review. Not from the writing point of view – I never even got that far because the layout and presentation was incorrect. You do not see mainstream, traditionally published books with double spacing between paragraphs, or the text aligned to the left (and therefore with a ragged right margin). Nor do you find novels published by the big publishing houses dotted on every page with obvious errors – or with one word (called “orphans”) or one line (called “widows”) stuck all on their own on a page. What amazes me are the number of authors who complain about a rejection on these grounds – look at it this way, if you go to buy a new dress, would you be happy, on getting home, to discover that the hem was not sewn up, and the buttons were uneven? If you buy a new tyre for your car, would you accept it with a bald patch, or a slow puncture? No, you would not. If you pay good money for something you expect to get your $’s worth. So why do Indie authors expect readers to buy, and read, a book that is incorrectly and somewhat shoddily produced? To be fair, not all authors realise these errors, some who I have contacted and explained the incorrect layout, etc, to have responded with grateful thanks, gone away, reprinted, and ended with a fabulous book, well worthy of boasting to be every bit as good as a mainstream novel. Isn’t that what authors want? For their pride and joy to be as good as – if not better than, other books? E-books are often badly set, because authors have discovered that they can upload to Amazon themselves for a cheap outlay. But without learning how the technical side of publishing a book should be done, all that is happening is that e-books are now getting the reputation of being cheap, shoddy, and poorly produced. I can see the time rapidly approaching when serious Indie authors who care enough to produce their books properly (see below) will be the ones paying to have their books printed as “book” books, while those who are not so bothered about ragged right margins, who do not see the importance of a professional editor and cover designer, and are quite happy with comic sans as a font, will be content with Kindle. Fair enough, at least then we will all know where we stand. If you could give aspiring SP authors advice on how to be successful in self-publishing, what are three crucial points you would want them to know? 1. Use a professional editor – full edit, copy edit, and proof read. Yes, I know it’s expensive, but if it is worth doing, it is worth doing it properly. 2. Either get professional assistance or learn how to publish your book professionally. Sorry, but double spacing, comic sans font, and left justified text is not a professional appearance. If it is worth doing, it is worth doing it properly. 3. Get a professional cover designer. Your cover is not just an image plonked on the front to make the book look pretty – it is the shop window to what is inside. You can, and we do, judge a book by its cover. If it is worth doing, it is worth doing it properly. Helen Hollick also has a number of blogs that readers can enjoy: http://www.helenhollick.net/ (where you can find links to other sub-blogs) and http://ofhistoryandkings.blogspot.com. To view the a list of her books, including her latest guide for self-publishing, Discovering the Diamond, please see the home page of helenhollick.net. *The title of this interview is a play on one of her blog titles. Thank you for sharing your story, Helen. This interview really resonated with me. My first novel got more full reads from agents than I can even count, with so many comments about the “wonderful writing”. But no one could figure out how to categorize it (magical realism? literary contemporary paranormal? historical timeslip?) so no one would take a risk. I self-published The Pilgrim Glass in 2010 to good reviews and happy readers. I ran into a similar problem with Oleanna. With nary a famous name in the story, no one wanted to take a chance on the book. Who wants to read about a farm family in 1905 Norway? Well, since I self-published the book in 2012, I’ve learned: quite a few, thank you very much. I like being an independent author. I am moved to write (and read!) 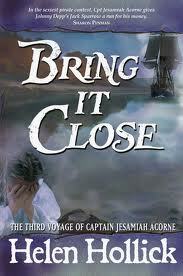 quality historical fiction outside the mainstream, and being an indie, I have the freedom do just that. Thank you Julie – the mindset of publishers baffles me. What is wrong with plain “Historical Adventure or just “fiction” etc or what about simple “cross genre” as a convenient marketing box? The Historical (or thriller, or romance, or whatever) Darn Good Read logo is good enough for me! I hope you’re submitted your Indie books to the HNS for review! We don’t care about what sort of crossover you have as long as the book is set prior to 1960. And thank you Andrea for inviting me onto your blog! I think when I finally came to realize that these are primarily business decisions on the part of agents and editors, and not artistic decisions, it made it easier for me to go independent and not take the decisions personally or take them as a commentary on my work. I get that they have commission percentages and profit margins to maintain, and that going with a safe(r) bet makes the most sense for their bottom line and shareholders. They’re not charities, after all, and that’s fine, and wonderful for authors who write what they’re looking for. Luckily, we live in a time where we can take control of our own modes of production and the attendant results. Thanks to social media, we can find the readers who are looking for exactly what we’re writing–and maybe didn’t even know they wanted it! I’m happy to say that Oleanna will be reviewed in the August HNS! Yes I agree with you – but – if a book is well written, with pace, professionalism, quality writing etc and is a good, readable, story…. I fail to see why publishers can’t as easily market these sort of books! Why are they turned down because its not a square peg in a square hole? After all we manage to market them and we do so without their enormous resources. If a book is on a bandwagon (re Wizards, Vampires, Jane Austen spin-offs) publishers/agents snap them up – regardless (on occasion!) of the standard! I completely understand that publishers can’t afford to take a punt on a possible good writer because, yes, they are a business, but will there come a time when anything that is slightly out of the ordinary will only be self published? I wonder… if J.K. Rowlng was only now submitting Harry Potter, getting turned down again & again (because “no one likes wizards”) & had she the money… would she have given up and gone self publish? “Luck is the residue of skill and desire” Helen Hollick sets a great example for many writers, including me. This was a very enlightening interview! Many traditionally published authors are choosing to go independed for the freedom of press, so to speak. Helen has given us some clearcut guidelines to be successful. Love this interview–it so resonates with me. When I was trying to find a publisher, I too got “like the writing but doesn’t fit in our lists.” To be fair, writing about Richard III in the 21st-century is not likely to fit in anyone’s list (except mine). So I went the SP route–did hire a professional editor and for the second book, found a small indie publisher where I do pay for some of the upfront costs. Today, the combination of digital books and print on demand makes publishing for the unknown writer not only possible, but quite attractive. I do also want to say how much I admire Sharon Kay Penman. She is one of the most generous person I have ever met. Thank you so much for mentioning her. There is one point that I do want to argue a little. While I agree that one can find more substandard production in SP and small Indie publications, the mid-sized and big house publishers are not immune. One large publisher’s ebook I recently bought had certain characters represented as question marks and extraneous characters at the beginning of chapters resulting from drop caps. It appeared the ebook wasn’t proofed!